Using an electric mixer, beat butter, sugar and citrus peels in a large bowl until light and creamy. Add eggs and vanilla; mix well, scraping the sides and bottom of bowl. Place flour and salt in small mixing bowl and mix with wire whisk; add to butter mixture and beat on low until blended. Add all the almonds, scrape sides and bottom of bowl and beat on medium setting. Divide the dough in half and place each half on a separate sheet of parchment or waxed paper; shape each into a rough log, about 1-1/4 inches diameter. Wrap the paper over the dough and roll to form a long log. Repeat with remaining dough. Refrigerate for at least an hour, to prevent dough from spreading too quickly while baking. Preheat the oven to 325°F. Prepare 2 baking sheets by lightly greasing with butter, or spray with non-stick vegetable spray. 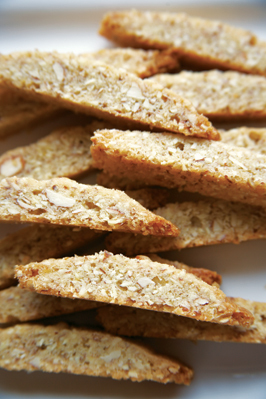 Remove paper wrap from biscotti logs and place in the center of baking sheets. Bake until the logs no longer feel raw in the middle and are just beginning to turn light brown on the edges, 25 to 30 minutes. Cool 20 minutes. Carefully move logs to a cutting board and cut into 1/2-inch slices. Lay the slices on their sides and bake again, until the cookies are light golden brown (10 to 15 minutes). Makes about 55 mini biscotti.